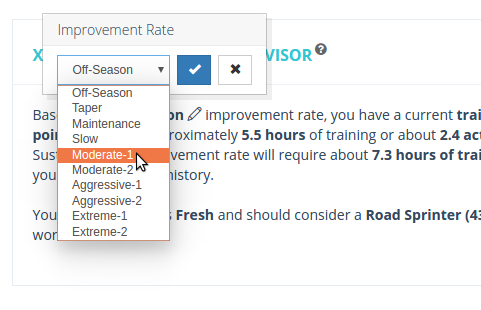 Off-Season -2 The Off-Season Improvement Rate can be used during times when you are intentionally looking to decrease your Training Load in preparation for an increase in training in the future. Switching to Off-Season can help you recover from a long period of training and give your mind and body a rest before getting into a more intense training regimen. Taper -1 This is the rate to choose once you’ve reached your goal and would like to maintain your fitness a week before your event and ensure you are appropriately recovered. Maintenance 0 This is the rate to choose once you’ve reached your goal and would like to maintain that level of fitness and performance. Slow 1 Generally used for blocks where you’re wanting to ease into your training period without a large time investment. Moderate 2 / 3 This choice enables a balance of higher intensity and volume with consistent recovery, enabling this improvement rate to be sustainable over longer blocks of training. Aggressive 4 / 5 An aggressive improvement rate can offer an opportunity to generate a great increase in your training load and fitness levels for a 3-4 week block. When training is executed precisely, it should be followed by a rest week to regain sufficient freshness before starting the next block of hard training. Extreme 6 / 7 Extreme levels offer an opportunity for high overloading and are great as a short term boost before your taper. Requiring both an increase in time and intensity, use these sparingly throughout the training calendar as they quickly lead to fatigue, requiring additional recovery. Baron Biosystems specializes in the area of exercise physiology and performance data analytics. The company has developed ground-breaking, innovative software models for both web, mobile and embedded applications that improve athletic training, performance and management. 2019 © Baron Biosystems Ltd. ALL Rights Reserved. Keep me informed of new features & news!